I got word a few weeks ago that the co-workers of my friend with cancer were having a benefit to help her with her medical expenses. One of fundraisers at the event would be themed raffle baskets, and the organizers were looking for handmade items to include in the baskets. I love raffle baskets, and anytime I’m at an event that has them, I have to put in at least a little money to try to win one. 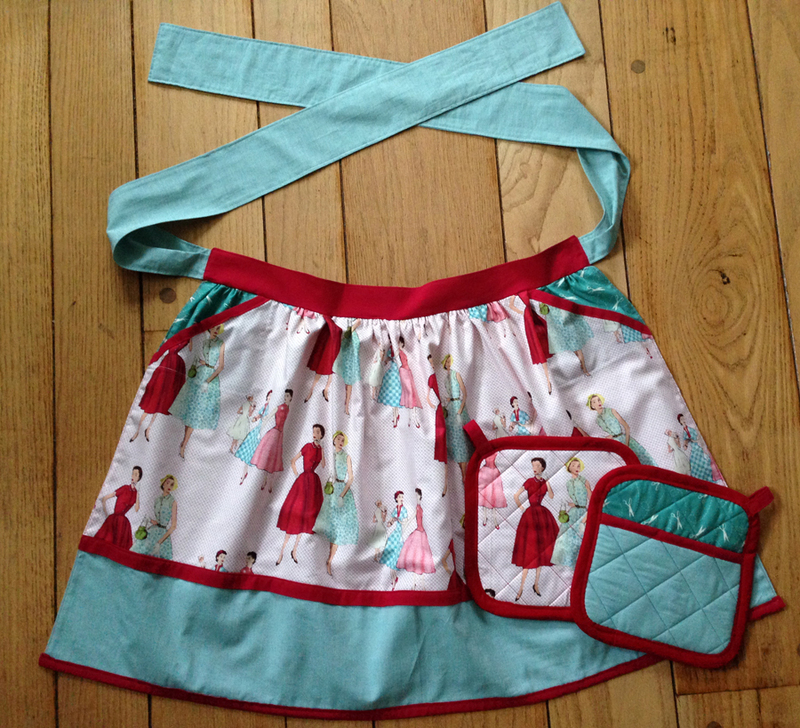 Anyway, I thought one possible theme that would work for the benefit was a kitchen theme, so I decided to make up an apron and pot holder set. 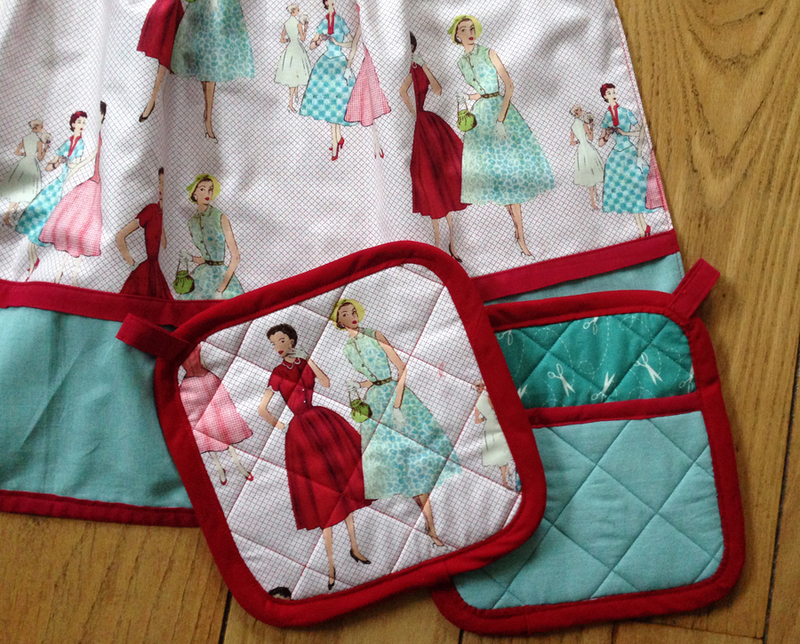 I found a tutorial titled Retro Half Apron with Matching Hot Pads from Sew4Home that seemed perfect. 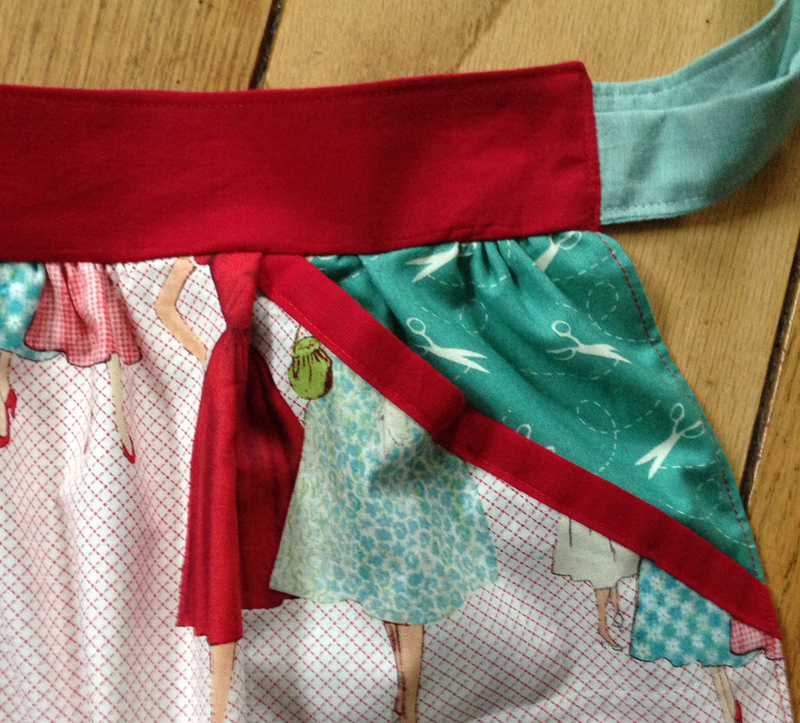 I started with the apron, since I’d made a few of those in the past. The fabric I chose was all pieces from my stash. The lady fabric was some I had picked up at Creativities craft shop and school here in Madeira. I loved the fabric, but I had no idea what I would use it for. 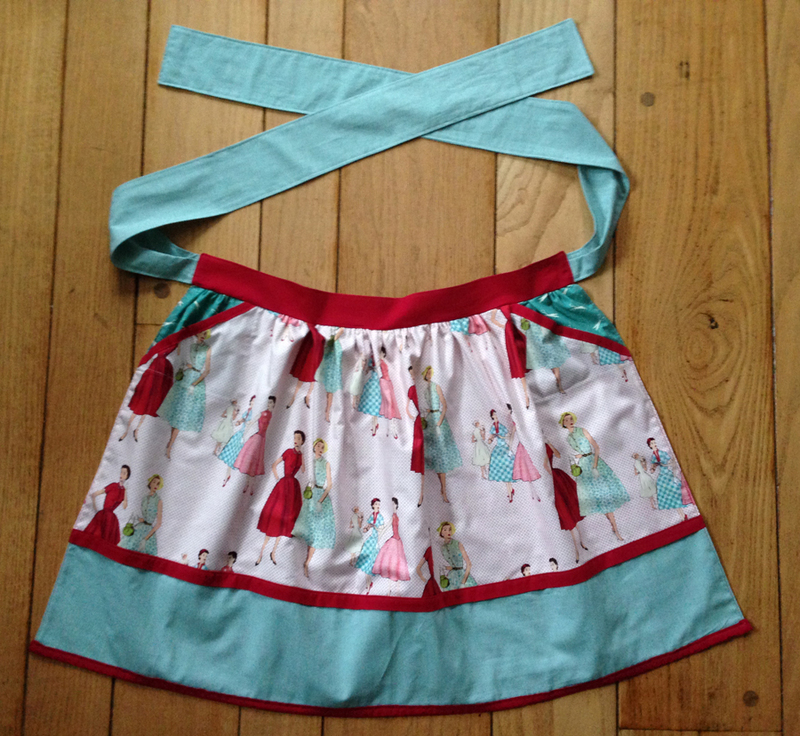 But it seemed perfectly suited for an apron when paired with a few solids I had around. 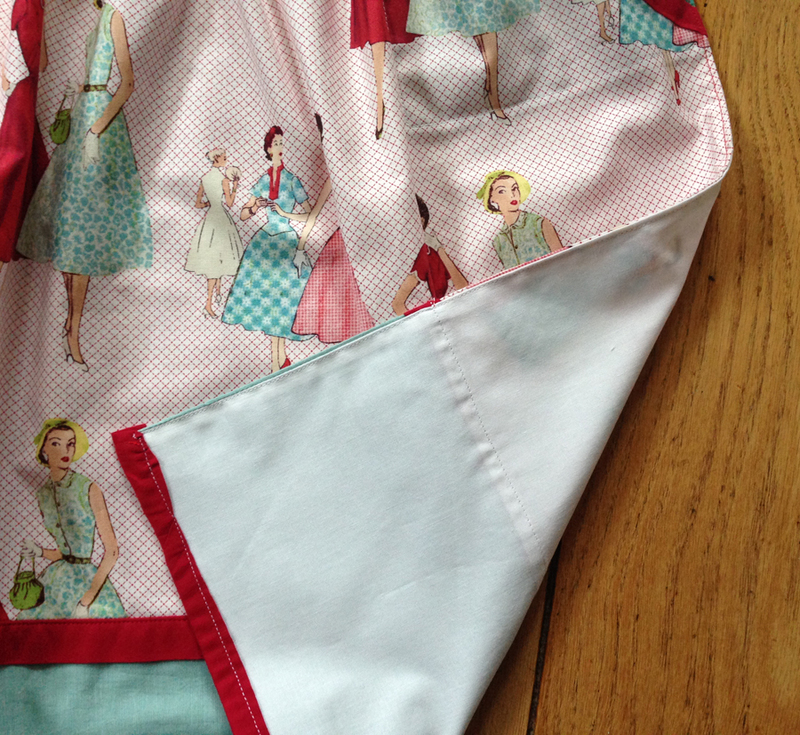 The apron pattern has a cute pocket detail that I decided to make with another print from my stash. It’s not super noticeable on the apron, but I like to think of it as a happy surprise if you do happen to see it. The pattern didn’t call for a lining, but once I put those pockets in, I didn’t like the thought of having the reverse side unlined. It just seemed too unfinished. So before I put on the bottom binding and the waistband, I lined the apron. To do this, just cut a piece of fabric to the same size as the apron, place wrong sides together, then sew along the two sides and the bottom, leaving the top open. Turn the apron right sides out, and edge-stitch around the two sides and bottom to make the edges nice and crisp. Then just follow the rest of the pattern for the waistband and bottom binding. With the apron finished to my satisfaction, I went on to make the pot holders. Ugh. Those were difficult. The pot holders themselves were easy enough, but the binding really got me. I was very low on the red fabric, so I tried binding them with strips cut on the grain rather than on the bias (cut on the bias, the strips have a bit of stretch to them). That was a fail. The corners were super bunchy and just bad. So then I bought some bias tape to bind the edges. But the white bias tape from the store was so sheer the other fabrics showed right through. I was going to have to find some more red fabric. I thought the fabric I was using was a Kaffe Fassett shot cotton, and I’d heard a store I’d never been to in Cincinnati carried some. So I went to Silk Road Textiles and was very happy with their selection of fabric and yarns. And they had a red that matched almost perfectly! 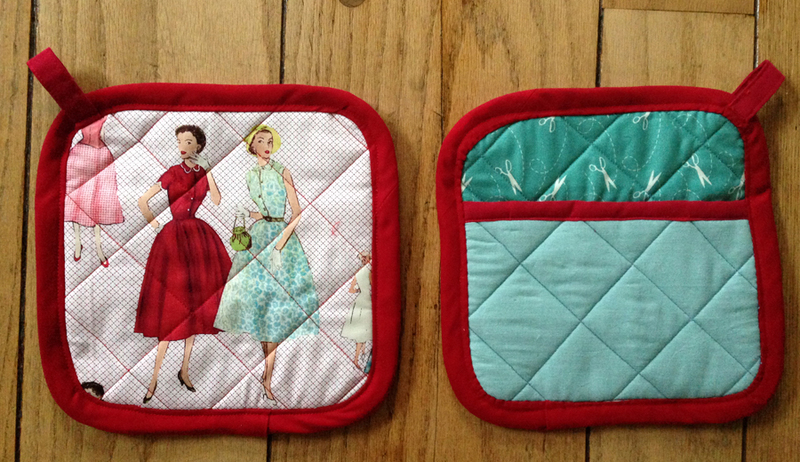 I cut the bias strips from the new red fabric and used that to bind the edges of the pot holders. It turns out, I just don’t have much experience sewing curves or sewing with bias strips. So after a couple of attempts, there’s still a good bit of bunching and a few misshapen corners, but they look better than they did. I do think they look pretty cute as a set. Anyway, I hope the organizers of the benefit can use them, and that whoever wins the raffle basket is happy to have them.